fascinating and very beautiful map of Iceland by Willem Janszoon Blaeu based on the work of Juris Carolus. Carolus was a Dutch traveler who probably derived his 1620s map from the Icelandic Bishop Gudbrandur Thorlaksson's work in the late sixteenth century. 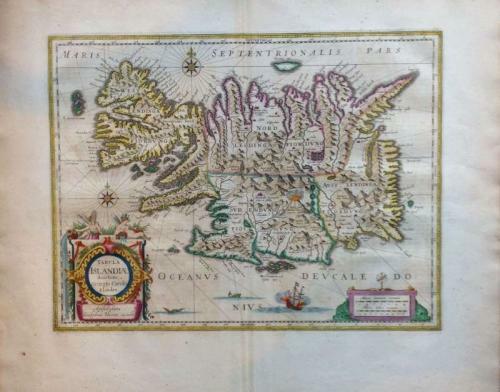 The Carolus map remained the standard map of Iceland for much of the seventeenth century with several publishers issuing versions. Blaeu's example is probably the most desirable of them all as the output of his firm has been called "the highest expression of Dutch cartographical art." The map has very bright colours and wide margins and includes a wealth of detail of the topography of the island (including an exploding volcano). Very good condition with minor overall toning.